The Barrel Inn (now called The Barrel Bar) has been around since the 17th century and was also its own brewery selling its own brewed malt hop beer. 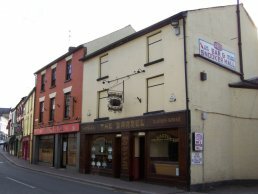 The Inn used to be larger and there used to be a second part to the Inn located between the current Bar and the site of the small building seen in the picture on the left. 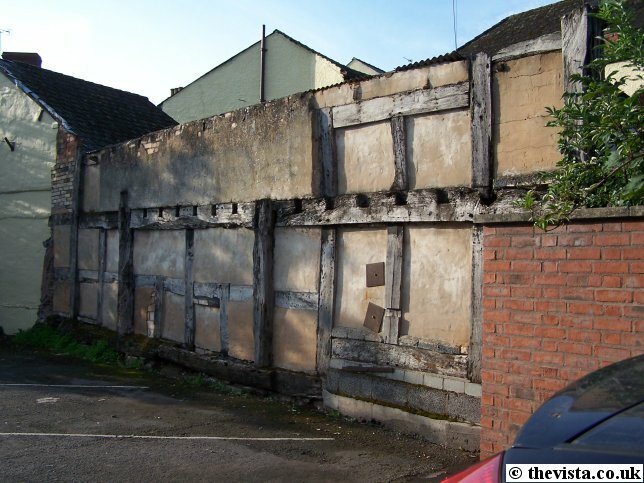 It used to be at least twice as wide as the existing building and was next to Blakes ironmongers shop, which has also been removed and is now the entrance to the swimming pool car park. 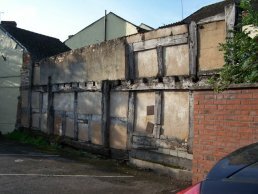 This section of wall at the entrance to the swimming pool car park is likely to have been one of the external or partition walls from the part of the Barrel Inn that has now been removed. 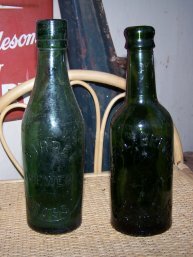 These are a couple of examples of beer bottles as used by the Barrel Brewery in Ross. 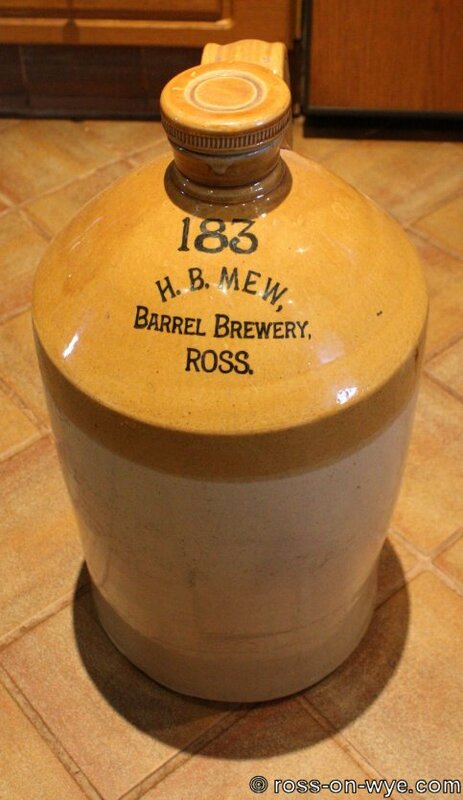 This is an example of a stoneware jar from H.B.Mew who ran the Barrel Brewery. 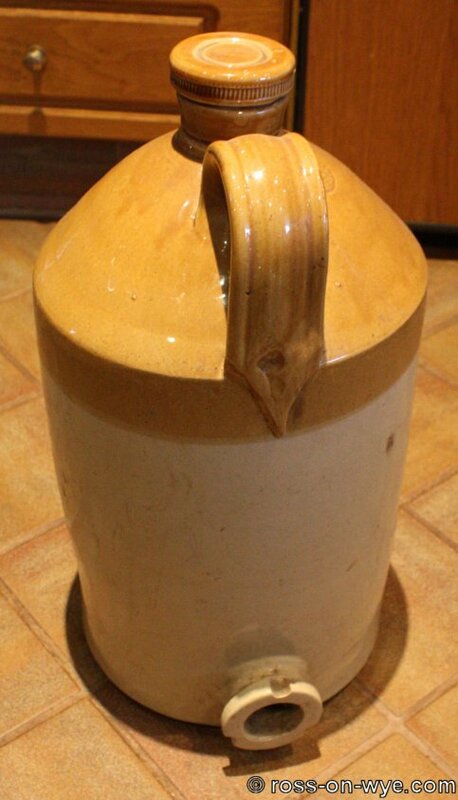 This jar has a tap connection on the rear and still has its stopper. On Tuesday 11th October 1927 the Barrel Brewery was auctioned. 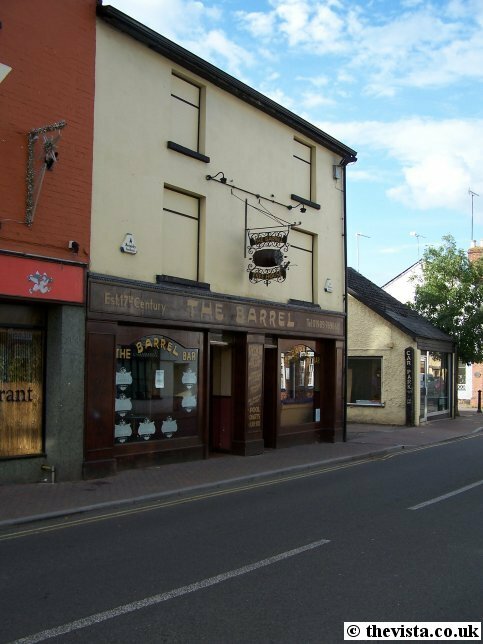 Bruton, Knowles & Co were instructed to sell the various leasehold and freehold properties (14 lots in all) associated with the brewery. 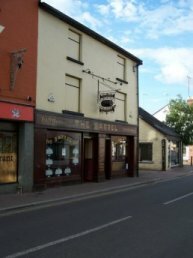 The sale was held at the Royal Hotel, Ross. Included in the sale were twelve licensed houses, the business premises and associated cottages spread across Ross and the surrounding countryside. comprise on the street frontage the offices and licensed shop for the retail trade and, approached by a side entrance, the stores, cellars and brewery. are constructed of brick and plaster work with slated roof and contain on the ground floor an office with a frontage width of 11 ft. 9 fitted with counter, desk and shelving. Adjoining is a double fronted shop, 16 ft 2 by 18 ft. 3 with a portion partitioned to form a small store. This shop is licensed for the retail trade in wines and spirits and communicates with the office. On the first floor are a private office, four store rooms and laboratory with sink. Electric light and telephone are installed and water is laid on. is approached by a side entrance from the street. The buildings are mainly of stone with tiled roofs and comprise malt store, two cellars with lofts over, store, sugar store, barrel washing shed, boiler and engine house, lean-to iron shed, copper house, cooling shed with mash room over carried on timber and iron girders, fermenting room and large store now used for minerals. At the rear of the premises is a large yard. The buildings are compact and provide accommodation for a plant capable of producing 60 barrels per week. The purchaser will be given an option exercisable within two weeks of the day of sale to take by valuation the whole of the fixed and movable plant, machinery and stock. In the event of such option not being exercised by the purchaser the vendor reserves the right to hold a sale by auction on the premises or otherwise of such effects and to remove the same without liability for unavoidable damage due to such removal. On the second floor are three bedrooms, box room and bath room. Gas and water are laid on and electric light is installed. The fixtures are the property of the licensee. The property is let to Mr Rennie at a tied rent of £50 a year. The whole of lot 1 is freehold.